made famous by their recurring roles on the Treehouse of Horror. Just the other day, The Grasshopper was watching the 1959 production of "The Atomic Submarine". Along with other movies of it's ilk, this flick formed an indelible impression on the young 'hopper's psyche. Seeing the movie after all these years didn't just sooth my nostalgia jones. When the monster appeared to confront the submariners--as seen in last week's post--he(?) instantly brought to mind The Simpsons twin green Rigellians. And, so, this set the Grasshopper on a google-and message-board fueled quest to discover the origins of the Groening/Kogen/Wolodarsky creation. Let's not forget the 1958 Forest Tucker vehicle (? 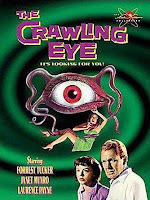 ), "The Crawling Eye". Originally entitled "The Trollenberg Terror", the film spins a yarn of gigantic radioactive telepathic creatures causing mischief in the Swiss Alps. Did I mention that they cruised around in icy fog banks and got their jollies by decapitating folks? A much better film than Mr. Corman's. 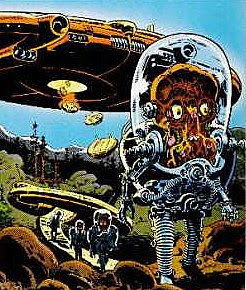 Then, it was off to wiki world, where Al Feldstein's cover art from EC Comics was given credit. But--which cover? 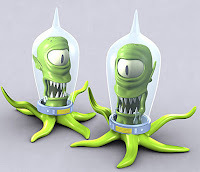 We decided to call in the SDMB braintrust...within minutes of asking, "What EC Comic Inspired Kang and Kodos? ", a comic book guy (ha) came up with two covers. 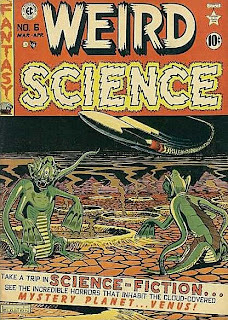 First off, WS #6, with the green bodies and one eye--but the tentacles here are supplemented by flipperish appendages. Not quite a match, but the family resemblance is undeniable. And finally, the cover of WS #16 was suggested. Here we see the familiar glass-bubble helmet, but this creature isn't monocular and it has "legs". So it seems that Kang and Kodos' heredity can't be traced to a single source. Clearly Matt Groening was inspired by all of these icons of 50s popular culture. editor's note: whew! that was a lot of work!